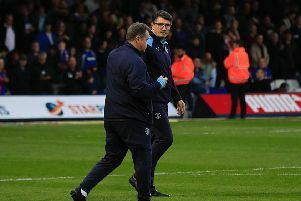 Hatters boss Mick Harford revealed he gave striker James Collins a ‘glowing reference’ when speaking to Republic of Ireland manager Mick McCarthy and assistant coach Robbie Keane about Town’s leading scorer. The 28-year-old earned his first call-up to the senior Irish squad this morning for their Euro 2020 qualifiers against Gibraltar and Georgia later this month. Both Keane and McCarthy had come to Kenilworth Road to watch the forward in action recently, Collins scoring in front of both of them, and contacted Harford to discuss Town's leading scorer's main attributes. On what he told them, Harford said: “Robbie Keane called up the day before the Wycombe game and we had a chat about him, I told him his strengths, and Mick called me up the day before we played Rochdale and we had a very similar chat. “I just told him about James, what his character was like, what he was like as a player, what he was like around the training ground and it was a glowing reference, as that’s the type of player he is. Collins had been training when the news came out this morning, the striker naturally overjoyed to make the senior squad after playing for both the U19s and U21s earlier in his career. Harford continued: "He’s thrilled and I had a big hug with him. "We both a had a tear in our eye, and it’s a massive honour to be called up for your country, he’s absolutely thrilled with it and we’re all delighted for him. “It’s testament to the hard work he puts in on the training ground and we as a football club, we’re absolutely thrilled for James with his work-rate, his effort, his commitment and obviously his goals, that he’s been rewarded for it. “It’s a massive honour for him, it’s a massive honour for the football club and it’s a big pat on the back for League One and the lower league clubs, because there are some good players at this level. Harford himself knows just what it is like to be called up for your country, winning two caps for England in the late 1980s, playing in friendlies against Israel and Denmark. When asked what it will be like if Collins gets a chance to feature in either match for Ireland, he added: “Pulling the shirt on, it will be his biggest honour ever in terms of it’s probably his biggest achievement in football to be called up for your country.